1) Place the sliced apples along with a sprinkle of water in a heavy 4-litre/quart saucepan. Cook covered over moderate heat until the apples soften. Fold in the fresh berries, one tablespoon (20 ml) sugar, and lemon juice. 2) In a bowl, combine the raw oats, unbleached plain flour, wholemeal flour, raw sugar, brown sugar and melted butter, rubbing in the butter until a course meal-like consistency is achieved. 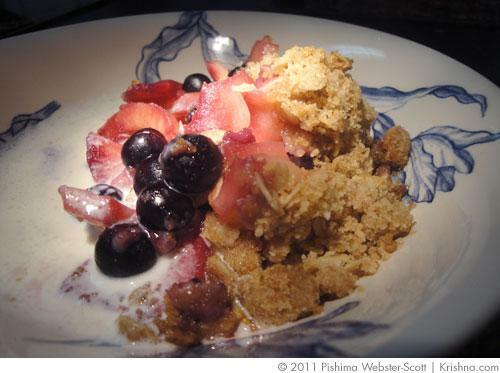 3) Spread the cooked apples and berries in the bottom of a 20 cm (18-inch) ovenproof baking dish. Without pressing down, spoon on all the topping. 4) Place the dish in the top one-third of a preheated 180 C/355 F oven and bake for 20 minutes or until the topping is golden brown. Serve hot. Submitted by Anonymous (not verified) on Mon, 07/25/2011 - 16:18. In the recipe ingredients there is no listing for wholemeal flour, yet on step number #2 the 3rd ingredient listed to combine is whole meal flour? Submitted by Pishima on Tue, 07/26/2011 - 10:28.
oops. Sorry that ingredient was left out for some reason. I have added it now as it should be. Thanks for letting me know! Submitted by Jnana Bhakti Dasa (not verified) on Tue, 02/08/2011 - 14:40.